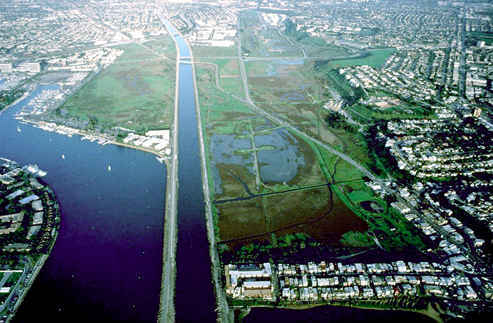 In the photograph, the blue color is the estuary of Ballona. The green color is the salt marsh of pickleplant and the California Pacific Coastal Prairie. The gray color is the urbanized area of buildings and roads. The southern California landscape pictured here is near and dear to my heart, spirit. Much of my scientific natural history research and restoration efforts are also focused on the greater Ballona Wetlands Ecosystem. These wetlands are currently being destroyed by land developers. Please read the articles on my site to find out who is responsible for the destruction and what you can do to stop it.